Tag line: "For Papillon survival was not enough .... he had to be free"
In 1931, petty crook Henri Charrière was sentenced to life in prison for the murder of a pimp named Roland Le Petit. Though he adamantly denied any involvement in the crime, Charrière was shipped off to a penal colony in French Guiana, and while there attempted to escape several times. 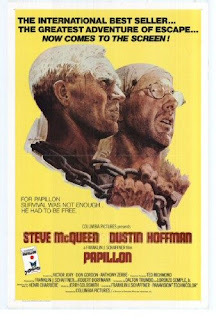 Papillon, a 1973 award-winning film directed by Franklin J. Schaffner and starring Steve McQueen, is a dramatized account of Charrière’s harrowing tale, and thanks to the immense talents of those involved the movie more than does his story justice. As the film begins, Charrière (McQueen), known to his fellow inmates as “Papillon” (due to the butterfly tattoo on his chest), is on his way to a place known as Devil’s Island, a prison facility so far removed from civilization that escape is damn near impossible. But that’s not going to stop Papillon, who is bound and determined to break out the first chance he gets. To raise funds for his initial attempt at freedom, he acts as bodyguard to Louis Dega (Dustin Hoffman), a notorious counterfeiter who (like many others) is hiding a nice sum of cash in his body cavity. Over the years, Papillon would make several attempts to escape, only to be caught each time and thrown in solitary confinement. Yet try as they might, the authorities could never break Papillon’s spirit, or his overwhelming desire to be free, and regardless of how many times he failed, Papillon never gave up. As he did 3 years earlier with Patton, director Franklin J. Schaffner brings an epic sensibility to Papillon, and many of the film’s sequences are large in scope; the initial scenes, during which Papillon, Dega, and dozens of other prisoners are marched through the streets to the docks below, where ships wait to carry them to French Guiana, is impressively handled; and the prison set itself (constructed in Falmouth, Jamaica) was massive (over 800 feet in length). Yet, much as he did in Patton, Schaffner never loses track of the story’s human element, and while Papillon is, indeed, a “big” film, it’s also an extremely personal account of one man’s continued efforts to gain his freedom. As Papillon, Steve McQueen delivers what may be his best screen performance. I understand the weight of that statement, especially when you consider the fine work he did in movies like Bullitt, The Great Escape, The Towering Inferno, and plenty of others. But in Papillon, he takes things a step further by abandoning the “McQueen persona” so prevalent in many of his other roles. Certainly, McQueen was one of his generation’s top actors, but he was also a big star, and in some of his greatest performances he brought a little of himself to the part; whether portraying Frank Bullitt or Junior Bonner, you always knew it was Steve McQueen. Papillon is another matter entirely. Though playing a man every bit as tough as some of his previous characters, McQueen allows Papillon’s vulnerabilities to shine through as well, more so than I’d ever seen from him before (the entire sequence in which Papillon is in solitary confinement is arguably the best piece of acting he ever turned in). There may still be some traces of Steve McQueen in Papillon, but it’s also the closest the actor ever came to disappearing in a role. In addition to the extraordinary work of its director and star, Papillon features yet another strong performance by Dustin Hoffman as the smart and wily Dega, who uses his money and influence to help Papillon whenever he can. And though you probably won’t recognize him under the layers of make-up, keep an eye out for Anthony Zerbe, who makes a brief yet memorable appearance as the leader of a leper colony. All this, combined with the movie’s stunning cinematography and the wonderful score composed by Jerry Goldsmith, helped make Papillon the incredible screen adventure that it is.